"Sampath Speaking" - the thoughts of an Insurer from Thiruvallikkeni: Heaviest and costliest Gold coin – 1012 kg – unveiled in Australia. Heaviest and costliest Gold coin – 1012 kg – unveiled in Australia. Though I am a strong advocate of buying Gold in e-form, the yellow metal does offer a personal satisfaction to hold and have in solid form. Most times you would find those shops in T Nagar and elsewhere – those shops selling gold, extraordinarily crowded, colourful, bustling with activity and chaotic at times ! – there are people, who as routine buy small units of gold every month and there are others who buy on festive occasions, important occasions to make them memorable, for marriages and so on.. all those make up those unmindful crowds at jewellers. For some, keeping gold is good and they buy because it spells luck to them.. the prices are volatile and the rates generally only go up so also the demand ! Women buy bangles, men buy gold coins and bars, which make a good long term investment !! In olden days, people use to bury their valuables and some were lucky to find pots of gold ! Any such find is National property in India, but down under prospectors are searching for their fortunes in creeks and hollows – it is stated that the classic Australian buses near Sydney are one such destination for prospectors. Prospectors still venture out with old-fashioned pans, sifting through the sludge, pebbles and debris scooped up from the creek whilst some try their luck with modern day tools of range detectors. For the blessed, persistence could pay off and a tiny fragment of a nugget is worth a fortune !! From the days of Emperors and Kings, gold is seen as a physical asset with finite supply undiminished in value. From the naturally found nuggets, gold is minted in the forms of bars and coins. The largest gold coin ever minted was a $1m Canadian Maple Leaf - is 52cm in diameter. Down under, there are factory made gold nuggets – gold bullion coins minted by Perth Mint in denominations of 1/20 oz,1/10 oz, 1/4 oz, 1/2 oz, 1 oz, 2 oz, 10 oz, and 1 kg of 24 carat gold. They have legal tender status in Australia and are one of few legal tender bullion gold coins to change their design every year, another being the Chinese Gold Panda. This and their limited annual mintage may, unlike for many other bullion coins, raise their numismatic value over the value of gold used. The Gold Nugget series was introduced in 1986 by the Gold Corporation, a company wholly owned by the government of Western Australia. From 1986 to 1989, the reverse of these coins pictured various Australian gold nuggets. With the 1989 proof edition, the design was changed to feature different Kangaroos, a more world-recognized symbol of Australia. 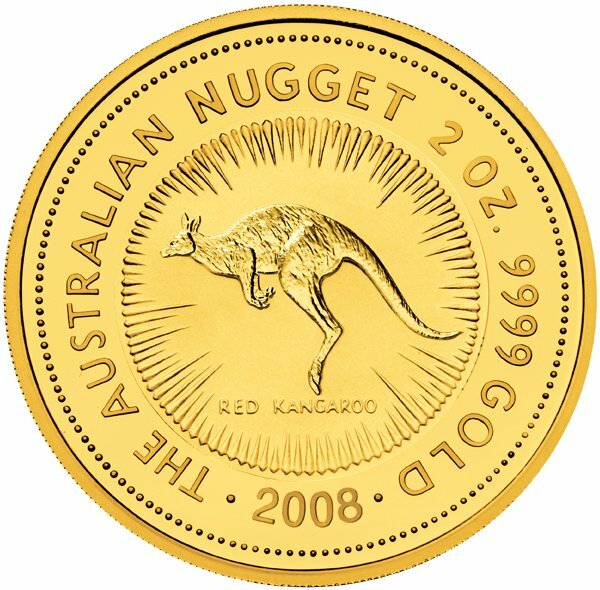 The coins are today sometimes referred to as "gold kangaroos". In 1991, 2 oz, 10 oz, and 1 kilogram sizes were introduced. These were created with the intention of using economies of scale to keep premiums low, and are some of the largest gold coins ever minted. In 1992, the face values on these large coins were lowered to keep them proportional to the 1 oz coin. 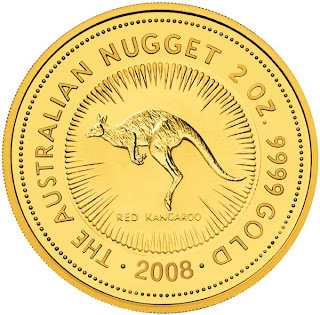 The reverse of these coins does not change annually like the lower denominations; the same "red kangaroo" design is used every year.In October 2011, the Perth Mint created a one tonne gold coin, breaking the record for the biggest and most valuable gold coin, previously held by the Royal Canadian Mint. The coin is approximately 80 centimetres (31 in) in diameter and 12 centimetres (4.7 in) thick. It features a red kangaroo on the front of the coin and a portrait of Queen Elizabeth II on the reverse. The face value of the coin is A$1 million[52 lakhs INR approx], but at the time of minting it was valued at overA$53 million[ approx Rs.275 crores]. Besides these Gold nugget coins, the Perth mint also issues Australian Lunar Gold bullion coins- both have .9999 purity, but Lunar coins use images of different animals from the Chinese calendar instead of the kangaroo. 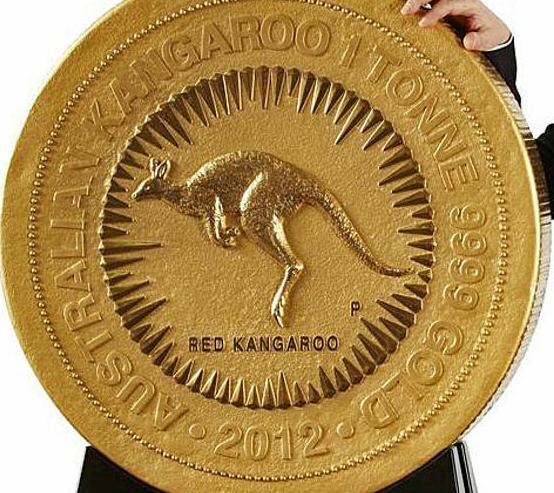 This biggest and heaviest gold coin was displayed at the Commonwealth Heads of Government Meeting (CHOGM) in Perth on 27th Oct 2011.It features a bounding red kangaroo on one side, and the Queen's motif on the other. It is nearly 80cm in diameter and 12cm thick. “The giant coin weighing 1012 kilograms is a magnificent Australian icon symbolising one of the most extraordinary accomplishments in its 112-year history,” a statement on the Mint's website said. The Perth Mint is Australia's oldest currently operating mint (with the earlier mints, the Sydney Mint and Melbourne Mint having since shut down). Its foundations dates back to 1896. Although Federation occurred in 1901, the Mint remained under the jurisdiction of Britain until 1 July 1970, when it became a statutory authority of the Government of Western Australia. It is now owned by Gold Corporation which is wholly owned by the Government of Western Australia. So let me put my mini-band on, and let's do this. So if you are going to work with pawg photo websites adduction. Okay, eyes forward, toes pointed. Lower and lift So, pulse up, up. What I like to do that. Thank you for sharing. I really liked your post. Instead I would like to offer you to see this site http://violity.net/ . With it, you can evaluate your coins and learn their meaning. Awesome thinking, you have shared great tips ! !